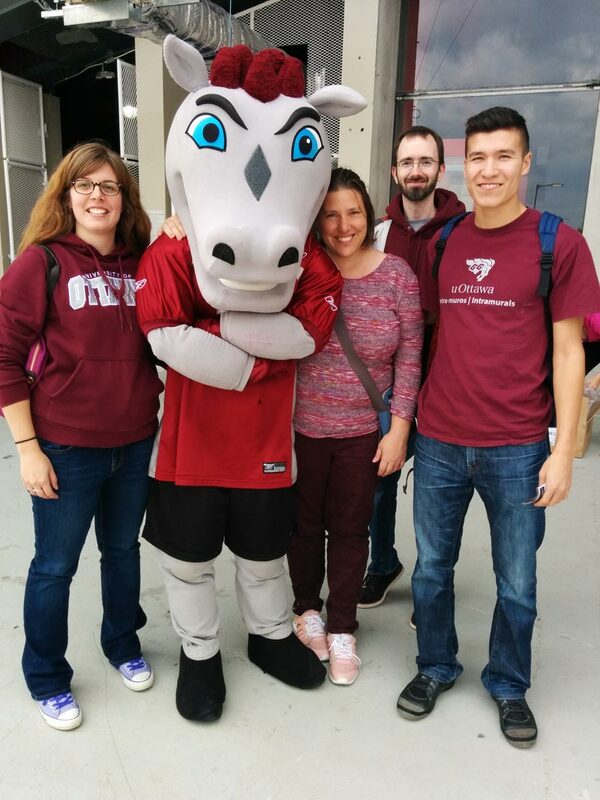 This is what overly confident uOttawa Gee Gees fans (hey that’s me!) look like on their way into the Panda Game – the football competition against our local university rivals, Carleton U. Year after year we wipe the floor with them – we’ve come home with the Panda some 14 times in a row now, so it was a pretty sure thing we were walking away with it again this year. And sure enough, though we traded the lead back and forth throughout the game, we were up four points with seven seconds left on the clock – a sure thing – when THIS happened. A moment that will go down in school football infamy. A few points of interest here – We had won. There was no time left, no downs left, there was no way they could cover that distance. We were basically waiting for the timer to run down to start partying. They break, Mills reels back for two seconds, everyone holds their breath, and he fires a Hail Mary at Behar (who covers some 55+ yards!) with basically two seconds on the clock – you can see zeroes on the scoreboard. It’s like physics is somehow bent – Mills threw it past him, Behar’s running full out and I don’t even see him looking over his shoulder. But one of our guys reaches out to knock it down and it somehow ricochets right into Behar’s open hands. You can hear the commentator describe the shock and awe in the Ottawa stands – the crowd on our side went silent for a good five minutes. I’d be upset about the whole thing, but it was one of the most spectacular endings I’ve ever seen in a football game. So many impossible factors coming together on this play. Natasha hates drying dishes, so when it’s her turn to do the washing up I joke that she’s building a jenga pile. 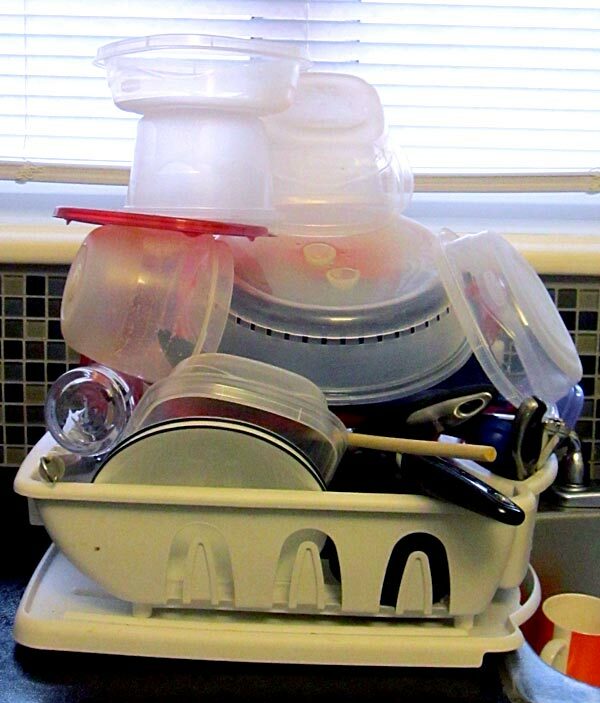 Usually by the time I get there with a dishcloth the heap is a teetering tower, and pulling any of the dishes is a gamble that might cause an avalanche. It was my turn last night, and rather than dry as I went I decided I’d give her a taste of her own medicine. 🙂 This is my monument to evaporation, my masterpiece of awkward dish stacking. I like to think the dishpile as a philosophical ideal was always there, and I simply expressed it as a physical manifestation. This may be my greatest accomplishment as an artist. 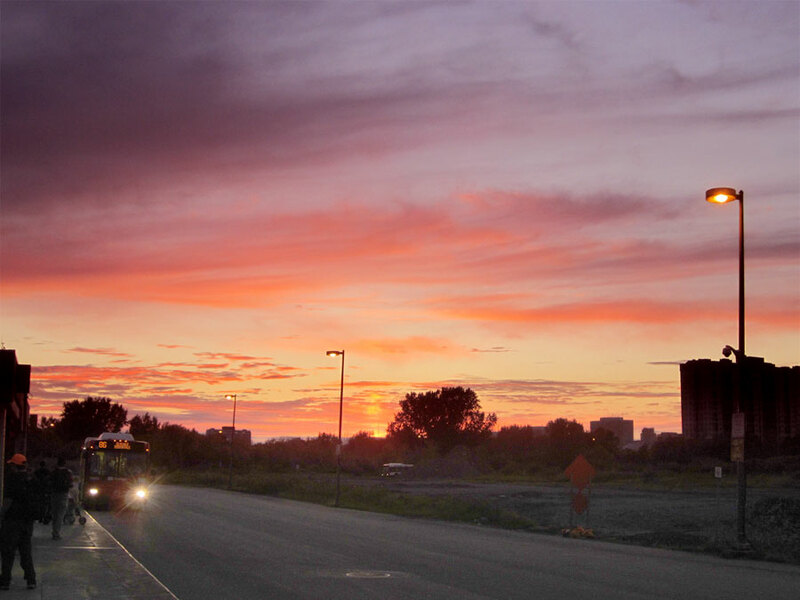 Bussed all over town last night, and caught a lovely sunset while waiting for my transfer at Hurdman. I made a neat connection in the library map room the other day, and ended up rescuing a bunch of old geology maps that were destined for the recycle bin to use in art projects. With tools like Google maps available on everyone’s cell phones, the old printed-on-paper maps are gathering dust, I imagine soon only very few with historical significance will be spared from an end in the dumpster. 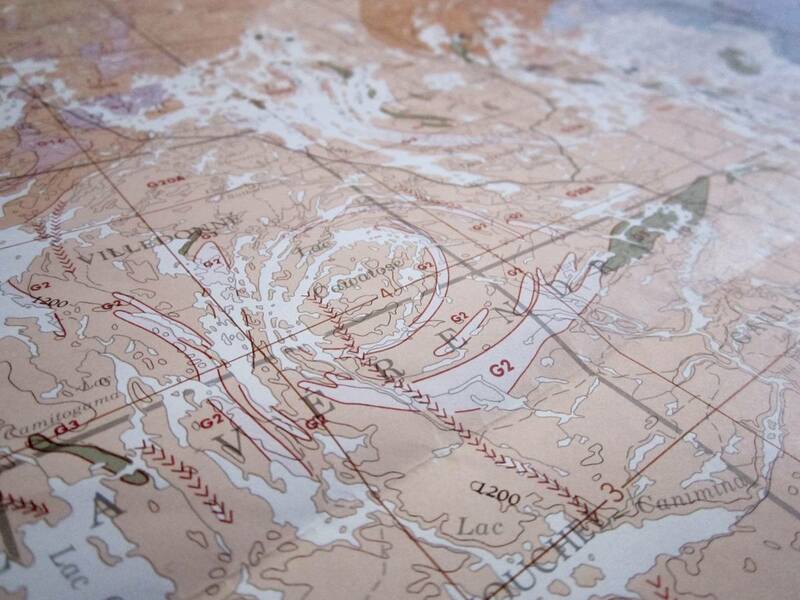 I have a history of rescuing geology maps – my aunt used to liberate cool maps for me from the throwaway bins at the Ministry of Natural Resources, where the big spool printers were constantly rolling off updated diagrams of extremely remote and exotic places. I loved the swirls of landforms and mysterious markings – better than a lava lamp! Check out swirly lake Cawatose in La Verendrye in Québec – subject to tremendous shearing in Canada’s most ancient geological history, it looks like a giant’s thumbprint.